I am going to try to make this year (yeah, I know I am getting a late start) the year of my blog...I miss writing here. So, today I started cleaning up the back garden, first bed where it all started years ago with a Malva sylvestris 'Zebrina' which isn't even in that bed any longer but it's descendants are in other places all over the front and back yards. I love it. Each Autumn I let the leaves fall where they may and provide mulch cover for the perennial roots, besides there is no way to rake up around all the plants and there are thousands of leaves from 4 Hackberrys, 2 Pecans, 3 Crepe Myrtles, one Mimosa and a variety of others that blow in from the neighborhood, ....and the old Charlie Brown TV cartoon makes a pile of Autumn leaves look way more fun than they actually are. Today I started scraping up the leaves in the first bed and got two Foxglove, one scarlet Dianthus (I am going back for more of these) planted. 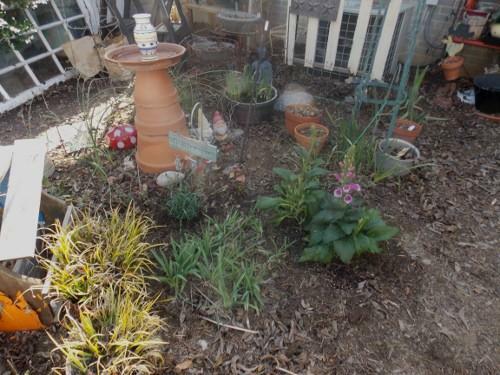 The Yarrow, Echinacea, Butterfly weed, Iris, Lilies, a couple I don't remember, Daisy, Penstemon digitalis 'Husker Red', Plumbago, Salvia, and assorted German Iris are coming back nicely. And a couple of things I planted last year but don't remember names for....will have to figure out what they are later. I worked on the north shade bed too but didn't take photos since there is almost nothing there to show off yet. But I will do that as soon as growing begins.